Jared Chavez grew up at San Felipe Pueblo in New Mexico's Rio Grand Valley, where he was immersed in his father's exquisite jewelry. In 1992, at the young age of 10, Jared learned the basic skills of jewelry making from his father, the renowned Richard Chavez, one of the leading lapidarists in the American Southwest. Despite the ongoing closeness of father and son, Jared notes, "My father has never imposed on me his views of what a jeweler should be . . . I have had complete freedom in pursuing the development of my career." Jared's artistic career led him to Georgetown University in Washington D.C., where he studied digital art and printmaking. 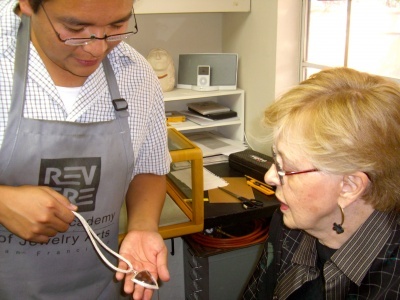 After graduating from Georgetown with a now wider array of artistic tools, Jared returned his focus to metalsmithing and expanded his technical training through courses at the Revere Academy of Jewelry Arts in San Francisco. Jared's art training coupled with his keen creative talent has produced stunning results in the American Indian jewelry world. Best known for his intricate and entirely unique silver designs, Jared also incorporates polished exotic stones including agate, jasper, hematite-in-quartz, and crystallized dinosaur bone into beautiful geometric compositions that are thoroughly modern and clearly influenced by his varied background in digital art, printmaking, and jewelry. Jared Chavez is certainly a young Native artist to watch, and his acclaim continues to grow. In fact, like fellow jeweler Liz Wallace, Jared has recently been awarded one of only five 2009 Southwestern Association for Indian Arts (SWAIA) fellowships. I'm not surprised at all by Jared's success as I've been a great admirer of his work from the beginning. It is with much enthusiasm that I introduce you!